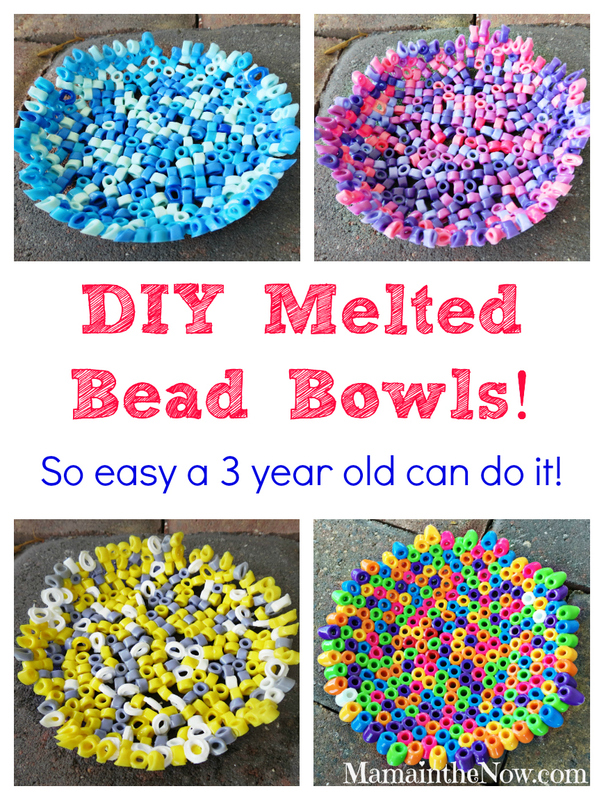 These bright and cheerful melted Perler fuse bead bowls are so easy a three year old can make them! Actually our three year old DID make these. Tomorrow our six and eight year olds want to make some too, because they felt like they missed out on ALL the fun! These bowls are surprisingly durable and make awesome Mother’s Day presents and teacher appreciation gifts. In short: the perfect handmade gift! We use these bowls throughout the house, one is the home of my car keys when I walk in the door. Another is where I put my jewelry at the end of the day. My husband leaves lose change in one, so ours are put to good use. I like to keep things simple when I get creative, and this project is no exception. Actually, it’s the poster child for easy and quick! Oven safe bowl. The bottom of the bowl must be the perfect mix between not too flat and not too round. Olive oil or cooking spray. I used olive oil. Oven. Do NOT use the microwave oven. Beads. Links below to the ones I used. I prefer the brand “Perler” to “Hama” beads. I find that the Perler beads melt into a smoother and shinier finish. Look at some of the white beads in my gray, yellow and white bowl. The white Hama beads didn’t melt as nicely as the colored Perler beads. I loved the way our Biggie beads bowl turned out and it is incredibly sturdy. The regular beads are easy and fun too and there is a bigger color selection. Wipe olive oil (or cooking spray) along the bottom and sides of the bowl. Place beads in the bowl. Be sure to cover the bottom and then go up along the sides as far as you wish. I love the look of a very shallow bowl, but you can easily make it a deeper bowl by adding more beads. When we used the Biggie beads (the larger size) I made sure they all stood up. But with the regular beads I just let them lay however they fell, which is also a cool look. Spread the beads out so they are in a single layer, not on top of each other, but close enough that there aren’t any big holes. The beads should be touching each other as much as possible. Bake in the middle of the oven for 10-15 minutes. The regular size beads melt quicker than the larger ones – no surprise there. Watch the beads closely. The bowl is done once all the beads in the bowl have started to melt and attach to each other. Remove from the oven. Let it cool for a few minutes and then place the entire bowl into a larger bowl full of water. Gently pop the bead bowl out. It should come out with light prying and poking. Allow the bowl to cool completely. Wash the finished bowl in warm water and soap to remove the oil. I love that the kids so easily can create something useful for around the house. Jansen (3) is THRILLED when he sees that we are using the bowls he designed and made. Where would you use a colorful melted bead bowl? 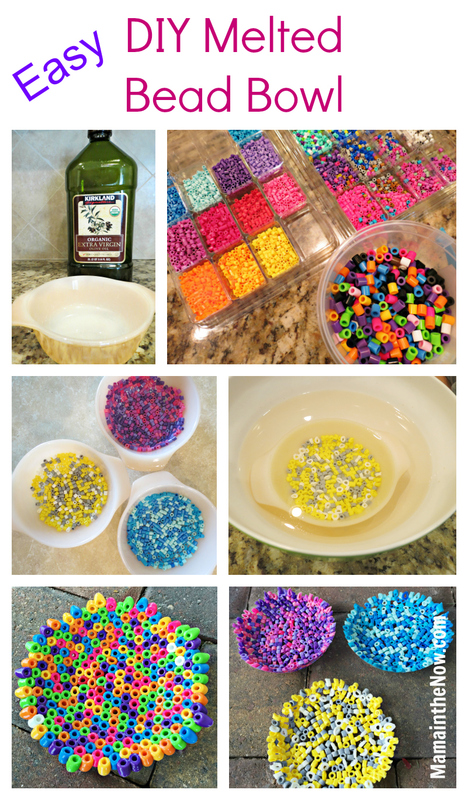 Get your child ready for preschool with Perler beads. 500+ Minecraft and Pokemon Perler fuse bead patterns. This is great and fun! How cute is this? My girls would LOVE this – where do you purchase these? Amazon? Yes – the links in the article are for Amazon. I got them all there. Michael’s craft store also sells them and their selection is getting better. But Amazon has the most of them! I think your girls would LOVE them – super easy and so durable! That’s so cool! I used to make those all the time when I was little but mine were always flat. This is so creative! So cool! I would use it on the dinner table for our salt and pepper shaker and napkins. This is a neat idea! I used to make all kinds of things with Perler beads a few years ago, and I’d sell them locally to get extra money. it was also good to ease my anxiety. I think my kids would love this! This would be such a fun craft for my son and me to do together. why can’t you use a microwave?